The megalithic constructions in Korea are mind blowing. Researchers still have more questions than answers, but the hundreds of dolmens are among the most fascinating archaeological sites in the Korean Peninsula. The first people appeared on the Korean Peninsula around 700,000 years ago. The society that lived there created an early culture based on farming. They continued this area until 1,000 BC. Over the years, they increased their use of bronze and cooper tools, improved their farming methods and created many settlements. These people of early Korea remain a mystery for researchers, but archeological sites have brought some information to light, giving life to this mysterious culture. One millennium before Christ, something changed in the Korean society. People started to build megalithic structures, which seem to be more characteristic of the other parts of the world. Dolmens are graves made of stone which are found in many parts of the world. They belong to the prehistoric era. Dolmens appear in many parts of eastern Asia, including China and Japan, but, due to unknown reasons, in Korea there is a surprisingly huge number of these constructions, especially in the sites located in Hwasun, Gochang, and Ganghwa. In Korea, dolmens are called ''goindol'', meaning ''the propped stone''. 40% of all of the world’s dolmens exist within South and North Korea. In South Korea, there are more than 30,000 dolmens, and up to 15,000 are found in North Korea. Unfortunately, due to the political issues, it is nearly impossible to explore the dolmens that are located in North Korea. All of the dolmens that have been examined are dated to around 1,000 BC, and they are proof that the society was already technologically advanced during this period. The number of dolmens may suggest that many people died in the same historical period, or that they were heroes from ancient battles between different tribes. Most of the dolmens are located in the north-western and south-western parts of the Peninsula. Dolmens are also located in the western part but in the smaller groups. Researchers believe that there could have been even more dolmens in Korea, but many of them were built near the seaside and destroyed during storms. Nowadays, the majority of the dolmens which have survived are located in Jeolla provinces, which include up to 20,000 dolmens. Most of the dolmens worldwide are dated to the Neolithic period, c. 4000 – 2000 BC. In Korea, the dolmens are far younger, suggesting the migration of populations from Europe or North America to the Korean Peninsula. The new inhabitants could have brought the tradition of building the famous Neolithic tombs into eastern Asia. This is one of the more rational explanations for the existence of Bronze Age dolmens in this part of the world. Interestingly, the dolmens don't have just one orientation, some are pointed west to east and some north to south. 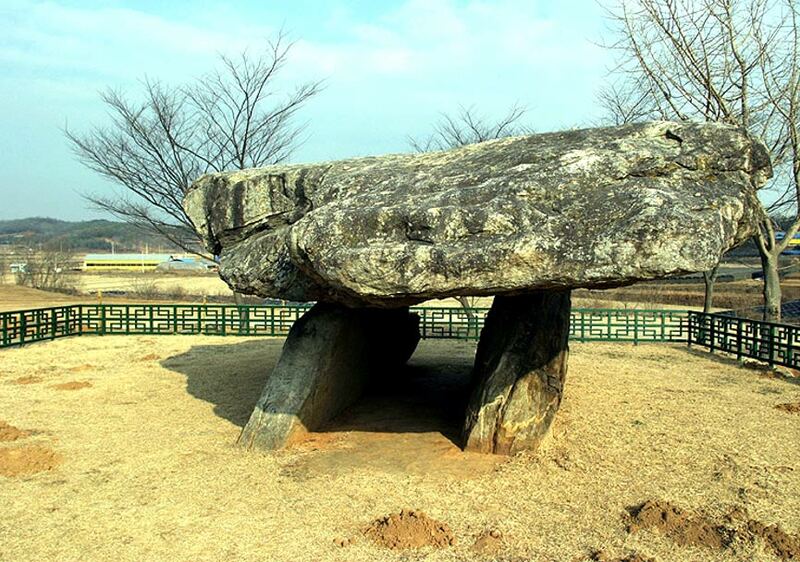 Research centers focused on the dolmens are located in Hwasun, Gochang, and Ganghwa. According to UNESCO, all of the constructions found there are original - this makes these sites one of the biggest centers of prehistoric megaliths. The largest group of dolmens is located in Gochang. This group of 440 constructions of various types is the most diverse and is centered in the village of Maesan. They were dated to 500-400 BC. Due to the existence of some bronze implements, some of them are suggested to have been family burials for tribal leaders. The site located in Hwasun is situated on the hills near the Jiseokgang River. Researchers have recorded a group of nearly 600 dolmens, and many of them were in the excellent shape. They were explored in 1995, and were dated to between 800 BC and 500 BC. Radiocarbon dating showed that the burial cists were from around 770 BC. The most famous of these dolmens is called ''Pingmae Bawi'', meaning ''the stone hurling rock'' and it's 7.3 meters (23.9 ft.) long, 5 meters (16.4ft.) wide and 4 meters (13.12 ft.) thick. It weights around 280 tons and it is one of the largest dolmens in the world. The dolmens of Ganghwa are situated on the island of Ganghwa. A group of 127 dolmens are located near the villages of Bugeun-ri, Osang-ri, Samgeo-ri, Gocheon-ri, and Gyosan-ri in Gwanghwa County. One of the biggest Korean dolmens is located in this area. The impressive structure is made up of two 2.5 meter (8.2 ft.) tall propping stones, with the capstone measuring 6.5 by 5.3 meters (21.3 x 17.3 ft.). The stone weighs about 50 tons and it’s been the top of the dolmen since the Bronze Age. In this area, researchers also discovered an agricultural settlement. Archeologists discovered human remains in many of the dolmens. Apart from typical burials, several graves of people who appeared to have been sacrificed for religious purposes were discovered too. Many dolmens were looted over the centuries, so archaeologists mainly discovered pottery. In 2000, the dolmens of Korea were recognized as important for World Heritage by UNESCO. They are considered as the finest Korean objects created during the Bronze Age. Nowadays, they are one of the most magnetic and fascinating structures in this region. Alongside exotic folklore found in both of the countries, the dolmens became a Korean symbol. Despite the lack of knowledge about the people who created them, the awareness of dolmens’ importance for Korean culture increases. With the rising number of tourists who arrive in Korea each year to explore the story of the oldest inhabitants of this area, Koreans have also increasingly become proud of the earliest of their ancestors. Many kurgans have also been discovered too. The most impressive belongs to King Muryeong, who ruled this area around 501 – 523 AD. Researchers note similarities between the Neolithic culture of Europe and the Bronze Age culture in Korea. The analogies between religions, types of graves, and artifacts discovered in tombs suggests that maybe one day the researchers will discover the key that confirms that the Bronze Age people of Korea were linked to tribes from other regions, for example Europe. Z. Krzak, Megality Świata, 2001. Dolmens are essentially cruder versions of the trilithons one sees at Stonehenge, ie. two uprights and a bridging lintel. Mere "symbolic" ornaments, when they exist on the opposite side of the planet from Wiltshire England? Surely not. There had to be a practical purpose, and indeed there was. Why go to all that trouble to attract birds, opportunist scavengers especially, making sure they were made to feel welcome and comfortable? Answer: think "sky burial". Nuff said. Oops. This handy feature on Korean dolmens seems to have led to what optimistically might be called the Rosetta Stone of stone circles! Simply googling (dolmen sky burial) led to a 2011 article in Popular Archaeology detailing the work of Dr.Rami Arav on a series of concentric circles assembled from loose basalt stones in the Golan Heights with a single dolmen at the centre. Yup, I think it’s no exaggeration to state that Arav’s stone circles with central dolmen are the Rosetta Stone which point to excarnation being international common practice in the pre-Bronze Age – from England, to the Middle East to Korea! Read more about Who Were the Ancient People that Built the Remarkable Megalithic Tombs of Malaga?